This month there is going to be a wonderful art exhibition on our doorstep, showing work by the renowned artist Norman Neasom who died in 2010. So prolific a painter was Neasom that his work could fill the largest of city galleries, but we are lucky enough to be able to see a selection of his best paintings and drawings at Forge Mill Needle Museum. So how local was Norman Neasom? The answer is “very local”, as Norman was born at his family home in Brockhill Lane, Redditch in November 1915 and educated at Redditch High School. Norman’s life was long and he lived through disturbing times such as WWI and the Spanish Civil War – these are reflected in his early work. But during the Second World War he was called back to work on the family farm and when the war ended he returned as a tutor to Birmingham College of Art. He also taught at Bourneville Art College and at Aston. Whilst teaching in Birmingham Norman worked on many murals including the new Birmingham Airport Hotel, Mitchell’s and Butlers Brewery and Barrows Stores in Corporation Street. From a very early age Norman would draw and paint on any scraps of paper he could find. This habit he picked up from his father who apparently used to draw faces in the margins of his newspaper, after a hard day’s work on the farm. He never worked from photographs, unless it was “raining cats and dogs”, and filled hundreds of sketchbooks in his lifetime. He believed that through drawing so much is learned about form, colour, light, shade and composition. From these observed sketches of landscapes and characters seen in local pubs, working on the land or even shopping in supermarkets, Norman would engage his imagination and plan a composition. The composition would then be lightly transferred to a working surface where he would develop the piece from sketchbook references and imagination, usually working in gouache, his favourite paint. The area where he lived, on the borders of Worcestershire, with Warwickshire lurking in the near distance, with its rolling hills and lush trees, is our area. Two characteristics come across clearly through Norman Neasom’s work. Firstly, he was a romantic and emotional man. 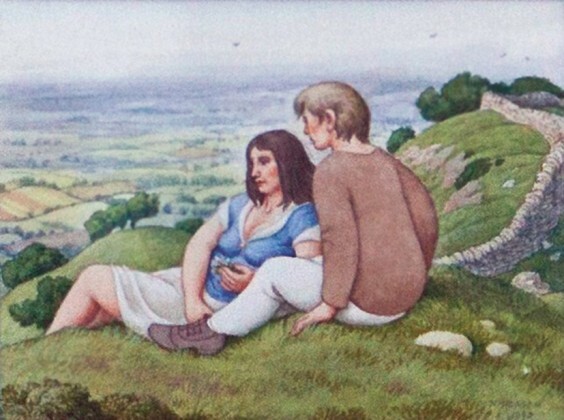 The Paradise Walk drawings and the lovers shown in Bredon Hill in Summertime are examples of this and pull at the viewer’s heart strings. was based on Housman’s poem Bredon Hill where, sad to say, there is no happy ending. Humour is the second characteristic that clearly comes across in many of Neasom’s illustrations. Some of the characters shown in his work, while not as blatantly flamboyant as Beryl Cook’s, make the viewer smile. It’s as if you recognise that lady with her shopping bags or the farmer and his mate harvesting hay. So was our local artist famous in his lifetime? Well, his work is in the permanent collections of Her Majesty the Queen, Birmingham Museum and Art Gallery, the Royal Watercolour Society, Royal Birmingham Society of Artists and the West Midlands Arts Council. In his lifetime he gained success and recognition as a professional watercolour painter exhibiting at the Royal Academy and many other galleries and art societies of note. But in the end you feel that Neasom would have painted whether or not anyone had taken notice of his work, because it was in him and because he was on a journey. Massive thanks go to John Hughes, a great friend of Neasom’s over many years, for supplying information for this article and allowing me use of images of Norman’s work.